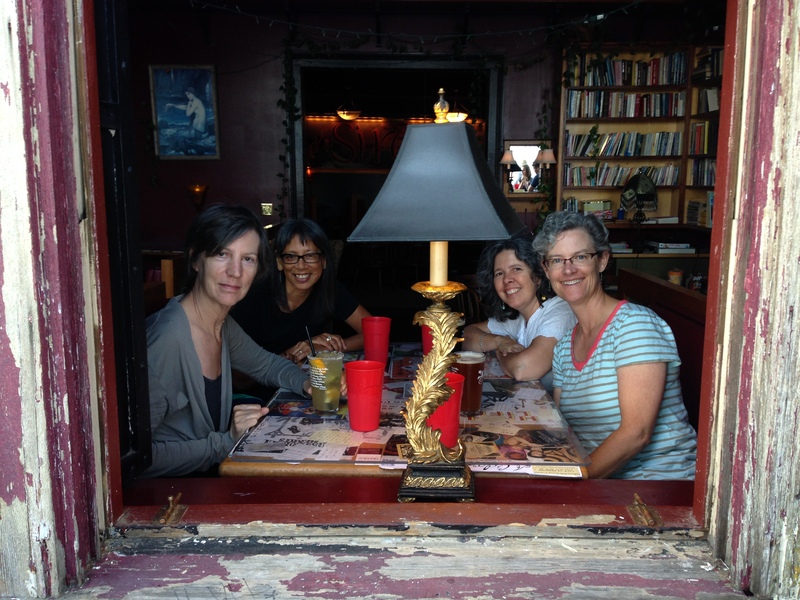 Once upon a time, four writers went to Fort Worden for a writing retreat: Waverly, Donna, Jennifer, and Allison. They spent a week working on short stories, essays, memoirs, novels, and proposals. They compared submission spreadsheets. One night, they read their work out loud. During the week, they took turns making dinner. They ate pasta, tacos, sandwiches, and salads. One of them surprised the others by baking parchment-wrapped cod that she had dusted with pollen from fennel growing outside one of their cottages. During the week, they drank coffee, tea, champagne, wine, beer, and juice. One of them infused vodka with lavender and made lavender vodka tonics. Guess which one. Surprisingly, they did not ever appear to get drunk. One of them went running every morning. A couple of them took long walks. One drove them into town whenever they needed strong coffee and good wi-fi. They tweeted, posted on Facebook, emailed children in far-off countries, and talked to family members at home. They listened to classical music, read the newspaper online, and, of course, read books. They played Scrabble three times. One of them felt kind of pouty when she lost, but she tried not to let it show. They watched deer sleep in the nearby shade, picked blackberries for their oatmeal, and toured the lighthouse. One talked to the Alfa Romeo-driving man staying in Alexander’s Castle and spun gothic mystery stories that might take place there. Mostly, they wrote. And wrote and wrote. This made them feel, at times, that it might be possible to live happily ever after. You put me there. I felt fog off the sea bluffs through windows of the officers’ quarters and barracks. Workshopping late with writers from everywhere, and the open mics. Centrum writer’s grant, two state cross country meets, leadership camp there — but my first memories are of summers coming on the ferry from Track camp at Fort Casey to run through town and up into the tunnels and gunner ramparts and old switchboard passages amid the trees along the bluffs. Yup — a magical place.